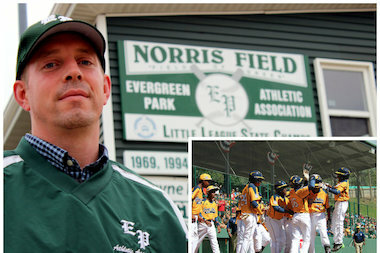 Evergreen Park Little League Vice President Chris Janes said he noticed news reports during and after the Little League World Series that quoted suburban officials celebrating various players as hometown heroes, which raised questions about whether Chicago-based Jackie Robinson West abided by Little League residency rules. CHICAGO — Evergreen Park Athletic Association Vice President Chris Janes, who first called for an investigation into Jackie Robinson West's boundary changes, says he has received several threatening phone calls, including death threats, since the team was stripped of its U.S. title Wednesday. "We got about 50 messages," he told DNAinfo Chicago. "I only listened to a few. Some were gibberish ... saying things like 'You're an a------.' A couple said, 'You deserve to die.'" "I'm not really concerned. People have been leaving s----- emails and voicemails." Janes said he has support from the local police. "An Evergreen Park police car has been parked in front of my house all morning," he said. In December, DNAinfo Chicago reported on how Janes claimed Jackie Robinson West was recruiting kids from the suburbs to build a super team. When DNAinfo questioned Little League International about the report, it assured us that everything was in order — but on Wednesday, the league stripped Jackie Robinson West of its title. “Good for Little League," Janes said Wednesday. "I feel like it’s a long time coming. We’ve seen the smoke for a little bit of time now. At the end of day, I’m glad they recognized that there were rules violations, and they’re holding them accountable." Janes has been taking a beating on social media for a while now, but maintains that he has no regrets about asking the league to investigate Jackie Robinson West's boundary maps. "Going forward, if anything comes out of this, Jackie Robinson West showed us all that it’s not very difficult to manipulate the most important rules in Little League," Janes said. "There’s got to be a way, and it won’t be easy, to put safeguards in place to make sure this doesn’t happen again. "Because if it weren’t for one or two or three people coming forward, Jackie Robinson West would not have been held accountable for this. Cheating shouldn’t be so hard to prove." The controversy began in late October when Janes sent an email on behalf of his south suburban league asking Little League International to investigate whether Jackie Robinson West engaged in “manipulating, bending and blatantly breaking the rules for the sole purpose of winning at all costs” by recruiting all-star players from outside its league boundaries to put together the “super team” that became U.S. champs. He said he had noticed news reports during and after the World Series that quoted suburban officials celebrating various players as hometown heroes, which struck him as odd since the kids were supposed to be living on Chicago's South Side. Janes said boundary maps should be made public and submitted online, so parents, coaches and players can check them out. "I think this is a step in [the] right direction to protecting the integrity of Little League," Janes said. "It’s a sad ending to [an] otherwise sad story, but it's an appropriate ending."